February 10, 2019, at 7:30 p.m. Created, Written, and Musically Directed by Brad Handshy. 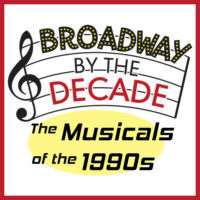 South Bay Musical Theatre is excited to present The Musicals of the 1990s as the eighth outing in our one-night-only Broadway by the Decade concert series. The 1990s were a decade of new American-made Broadway shows like Aida, The Will Rogers Follies, Rent, Once on This Island, and The Secret Garden; movie-inspired adaptations like Ragtime, The Goodbye Girl, Big, and Kiss of the Spiderwoman; as well as British imports such as Sunset Boulevard and Miss Saigon. The concert will be packed with familiar songs from shows of the 90s, as well as some “undiscovered gems” that just might become your new favorites. With musical direction by Brad Handshy, the concert is performed by many of SBMT’s best-loved vocalists, and includes over two dozen outstanding songs that highlight the bounty of Broadway musicals of the 1990s.